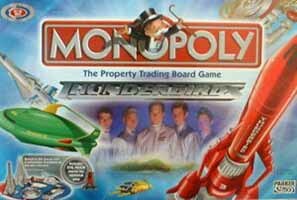 Everyone has (or should have) a copy of Monopoly hiding away somewhere in their house. It's an old favourite and you can't go far wrong - not even when you mix it with the cinematic disaster that was Thunderbirds. 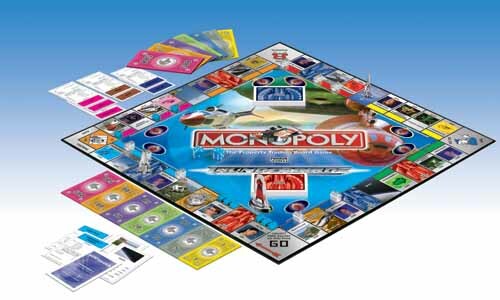 In this edition you can fly, cruise and sail around the board, in a bid to save the world, using one of the six counters included: Thunderbirds vehicles 1, 2, 3, 4, 5 and FAB1. And it's not just the counters that have a Thunderbirds theme. The money has an International Rescue flavour, as do the properties. Tracy Island is the most expensive property on the board in place of Mayfair and chic socialite Lady Penelope, along with her butler and chauffeur Parker and her expensive Rolls Royce Fab1, take up residence on the boards pink space. Brain's assistant Tin Tin inhabits the unpopular brown space usually occupied by Old Kent Road. Nuclear Power and Rocket Fuel replace the classic game's Electric Company and Water Works and the infamous Chance and Community Chest cards have been converted to Red Missions and Blue Missions. The Hood also makes an appearance in the game, with players deciding whether or not he should interfere with their mission. Thunderbirds fans will no doubt snap this edition up - and who can blame them. The International Rescue theme certainly helps to modernise an old classic.